The pinnacle of American Nationalism for the year is just past. Robert made his own “patriotic” splash on the 3rd and 4th marching in the local parades, waving his own flag and singing You’re a Grand Old Flag. You should have been there. Terri Steuben at the Chamber of Commerce told me the Cub Scouts needed flags - from my collection - for their entry in the parade. The hospital wanted some, too. And, the theme for the annual parades was Flags of Our Fathers. So, I had to join in. 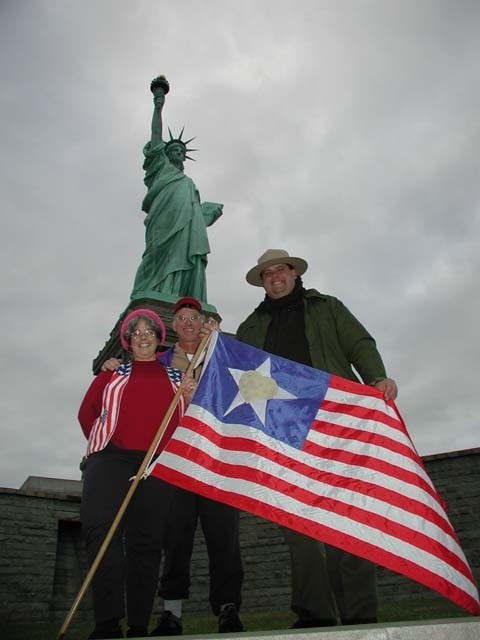 Put on the backpack I carried across the country in 2002 and displayed my own flag, Fannie, who accompanied from Lavina, MT, to Liberty Island. The symbol above is, to me, the Heart and Soul of the American flag. It you count up the major parts of the images and ponder them you may get some hints why the American flag - in particular the original concept - has some deep esoteric meanings. Definitely worth your consideration. 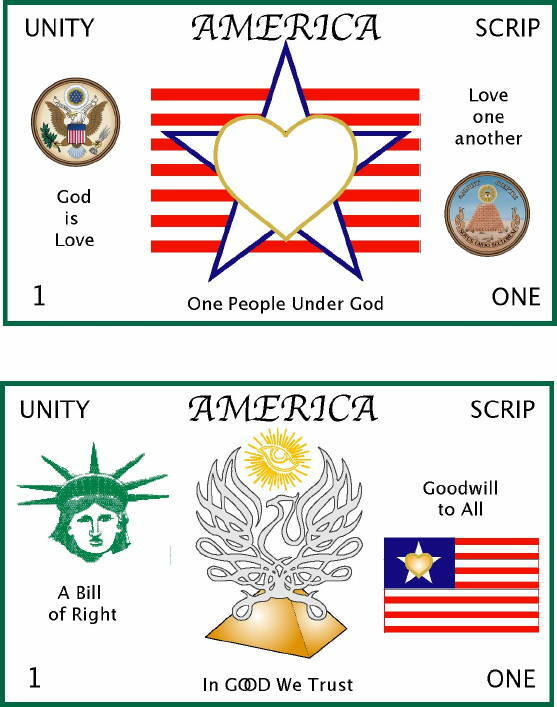 The second figure was spurred by Peace (Ginger) Arnold’s suggestion that I use some of my favorite symbols to create a new currency - front and reverse of a New Bill. Local currency is one of her interests. It has been a passing one for me as well. I have tried to inform locals about the value of local currency, but not gotten very far. For the moment, just the idea may be worth your own contemplation. Money is important, but what it stands for is more so. American symbols and those on the dollar bill have faded, become trampled on more than a bit and need to be resurrected in many ways. Your thoughts and comments on the New Bill are invited. If you have interest in using any of these symbols or collections thereof, I will be happy to make them available to you in a usable format. One more addition is an article I wrote years ago about Fannie the Flag. At the time, Meryl Ann Butler was working on a potential book devoted to the stories behind fabric art pieces. You might enjoy the Fannie the Flag story. I walk the road many miles day after day with a lady. She’s just a wisp of a thing but still turns many heads - heads of men and women, young and old alike. My lady friend is the quietest, calmest female I’ve ever known. She speaks boldly without words. She can’t help but show her true colors and thus makes people pay attention. At the same time, the stares and hollers of admiration she attracts make my tired feet ache a little less over the stretches of those long walks. Strangely, even though she’s been at my side for many months, her real name is unknown to me. So, I simply call my friend, Fannie. Fannie is the flag I carried for miles and miles across America during the summer of 2002. Fannie was my partner on a 2100-mile journey from Lavina, Montana, to Liberty Island in New York Harbor. Fannie and I started down the road on June 11, 2002, and completed our journey at the feet of the Lady Liberty on November 3. We took some photos with Her and conferred quietly on the symbolic state of America. After riding the ferry to Manhattan and taking the train to Queens, we were guests at a welcoming party in Douglaston. to become the United STATE of America. That One Star may remind us of our longheld motto, E Pluribus Unum (From Many One) as well as the currently popular one, United We Stand. Fannie and I expectantly and happily walked across many state lines. We noticed distinct differences from state to state in terrain, in architecture, in temperament. We saw the sagebrush prairies of Montana blend into the wheat fields of North Dakota and those into the Land of Lakes in Minnesota and the Dairyland of Wisconsin, and later into the manufacturing areas of Michigan, eventually blending with neighboring Canada and finally culminating in the original coastal colonies of New York, Pennsylvania, and New Jersey. Glowing in the midst of Fannie’s single star is a golden heart. This heart element is as yet unknown to national flags. But, it may be time for a true birthing of heart in the great land of America. This flag can easily bring to mind the Golden Rule, that “God is Love,” and that we are intended to be One Nation Under God. Fannie and I often recognized both the material abundance and human benevolence of this country in the course of our journey. We received gifts of food and lodging, transportation and conversation, encouragement and prayers from so many. The heart of America and Americans is so strong and vibrant; why shouldn't it be allowed greater respect and even be exhibited on our national banner? The fabric of Fannie's golden heart has 13 little stars woven into it. The many states and parts and people of our nation are not lost in the greater unit but retain their individuality and diversity within the Whole. While the states and peoples of America have much in common, a walk across this country revealed so many aspects of what I call our "uniquity." This was never more apparent than when we trekked through small towns, sat in their memorial parks, attended celebrations, ate in their cozy cafes, listened to people’s concerns and aspirations. We saw the work of hands and hearts in the arts and crafts, paintings and photography, design and sculpture that decorate houses and businesses and farms everywhere. Although this walk across America may have appeared to be one of worldly exploration, it was also an inner quest for meaning exemplified by the flag I carried, Fannie herself. Her identity may be made somewhat more recognizable by reviewing her ancestry as well as her construction. To really get to know Fannie, you have to meet her elders. Fannie's ancestry dates from the appearance of her elder sister on the second story wall of the old county garage in Lavina, Montana. With help from my family, I purchased that 6000-square-foot building in 1997. We proceeded to repair and refurbish the subsequently renamed Rocky Mountain Garage. Our first project was a Red White and Blue paint job (what else?) on the wooden surfaces of the largely brick structure. As the upgrade continued, I colored the original flag - 20 by 12 feet - onto the second story south facing wall. This flag had a pink heart, at first, resting over the single white star on the field of blue. Fannie's second sister is a quilt which I designed and sewed with the help of Jeanne Meyer, Janet Ecord and Karen Murnion. It has bright lively colors and a border which reads "God Bless America." The quilted flag finds its major use as a backdrop to the Rocky Mountain Garage's stage constructed in 1998 to hold the first annual and subsequent Red White and Blue Celebrations. Fannie is a mere lightweight compared to her sisters. She only measures 3 by 5 feet, but took many hours to construct: to cut out, piece together, sew, and create a protective sheath. Fannie is composed of Red White and Blue nylon I cut with a soldering iron to prevent fraying and sewed together on an inexpensive machine. Her two golden hearts (one on each side) were ironed onto her white stars using Wonder Under. Finally, Fannie’s fabric was attached to the 5-foot wooden staff which I carried across America. Down the road, I periodically used a match to seal minor nylon frays. I also purchased a needle and thread in North Dakota to keep the hearts from falling off their stars. This may well have symbolized my own need to be reenergized and reinspired at different times along the way. The dream/project/task of walking America was WORK, but it was also magical. Walking with the Fannie the Flag was a timely event, a reminder of the goodness of America, and a confirmation that Love is at work and alive in the hearts of our people. I had many sources of inspirations in this journey. Supported by a deep sense of the Divine in all things, an awareness of the spirit of the Founding Fathers at large in the land, the remembrance of prayers sent our way from Lavina to New York City, and the waves and salutes along the road, I was assured that this Walk Across America had merit and meaning. Still, I now see that my greatest inspiration for this passage was none other than Lady Fannie. At the Statue of Liberty, as Fannie and I had our pictures taken with friends, we attracted the attention of visitors and park rangers alike. In a final touching moment of the trip, a young Asian-American man wearing a Yankee baseball jacket asked to borrow the Flag for his own personal photo session with this lively, lovely national emblem. Fannie the Flag not only recalls America's past grandeur but also hints at many of our greater possibilities which remain to be fulfilled. Fannie, thanks for walking the road with me.